We are passionate about bicycles in all there forms but as cycle mechanics our enthusiasm is for the craftsmanship of bicycle design. Modern cycles are fantastic with modern materials, carbon, exotic alloys etc but they rarely stand up against the beauty of a classic hand built steel frame. All our vintage frames are sourced for their condition and suitability for either restoration or conversion. 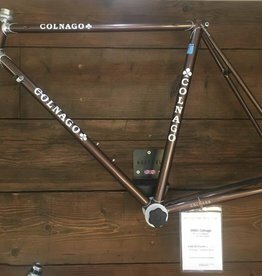 We source frames from classic popular brands such as Raleigh, BSA, Peugeot, Mercier to collectable Italian classics such as Colnago. Our current stock is visible here. Frames & Forks are sold as seen or we can offer a bespoke build, please call to discuss options. Many older frames can take modern group sets but this depends on many factors such as drop out width, chain stay length and cable routing. Many 1970's/80's frames are ideal for conversion to fixed gear / sign speed commuting bicycles. Where possible we use original parts accompanied with modern alternatives which complement the frame.